03/18/2019 03/30/2019 - by Mark Hyde - 3 Comments. As a student, you need a laptop because it is just as important as your textbook and school ID. The laptop should be more than just for school and work. I’m talking about being capable of handling other activities such as social networking, multimedia, online chatting and browsing the web. To crown it all, it should be able to last you through the long haul of college education. If your budget is not at par for a MacOS, then you need a Windows laptop, better yet cheap laptop like a Chromebook. 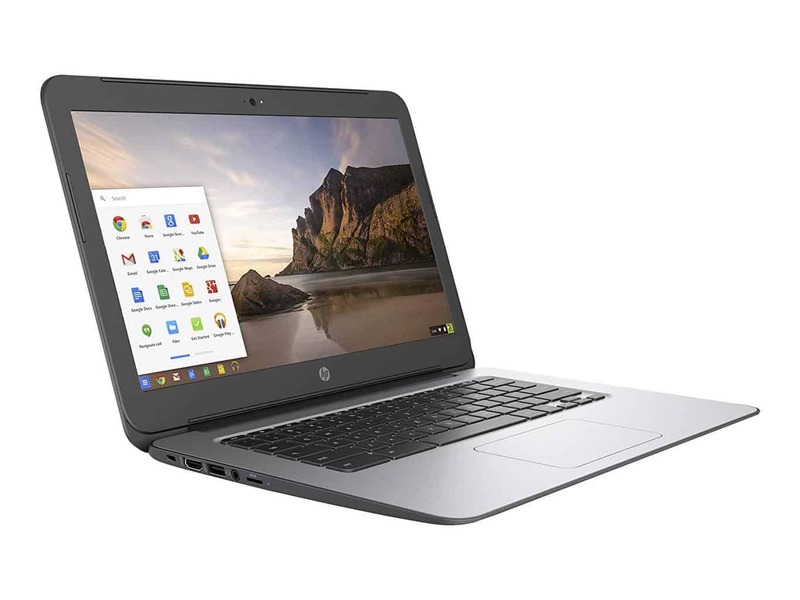 Speaking of Chromebooks, HP is adding a new Chromebook to its lineup, the HP Chromebook T4M32UT#ABA 14-Inch Laptop; a low-resolution configuration of the HP Chromebook 14 series. As Chromebooks get bigger and better, the HP Chromebook 14 strives to make its name as an ultrathin, light and budget product, just as other low-end priced Chromebooks. The HP Chromebook T4M32UT#ABA 14-Inch Laptop is a master of art in the Chromebook scene bringing in strong multitasking performance, decent battery life, design, and strong audio. But its competitors offer better battery life and brighter, crisper displays. After seeing a dozen other Windows laptops and a fair share of Chromebooks in the market, I would say the Chromebook 14 is not the prettiest or the most inspiring. But it does look a bit more brash and loud in a modest-good-way, considering its matte black case finish. Our model sports a dark lid that’s nice to grip and far more luxurious to hold than its plastic body suggests. Our model sports a dark lid that’s nice to grip and far more luxurious to hold than its plastic body suggests. At 14 inches, the HP Chromebook T4M32UT#ABA 14-Inch Laptop is a sizeable laptop that’s great for the business, research, and movies. Our biggest gripe with it is the lack of support for 1080p. Compared to other Full HD displays, the screen looks lowly. The 1366 x 768 display offers far less clarity compared to 1080p. But while the viewing angles aren’t super-duper, the decent color reproduction makes the images come to life. Watching the Blade Runner 2049 trailer on YouTube in 720p HD, the colors were the correct shades, images crystal and clear. All the edges have slow and smoothly tuned curves. The bezel is also slightly thick and it sports a rubberized strip running around the lid to braze it from shock and bumps. Moving on, the display measures 13.54 x 9.44 x 0.7 inches which is larger than the Dell Chromebook 3189 (12 x 8.2 x 0.9 inches, weighs 3.2 pounds) and the Asus Chromebook Flip C302CA (11.9 x 8.3 x 0.6 inches, weighs 2.6 pounds). The screen opens up to 120 degrees which isn’t as good as other convertibles, but not a deal breaker nonetheless. A healthy port system gives room for syncing with other devices. 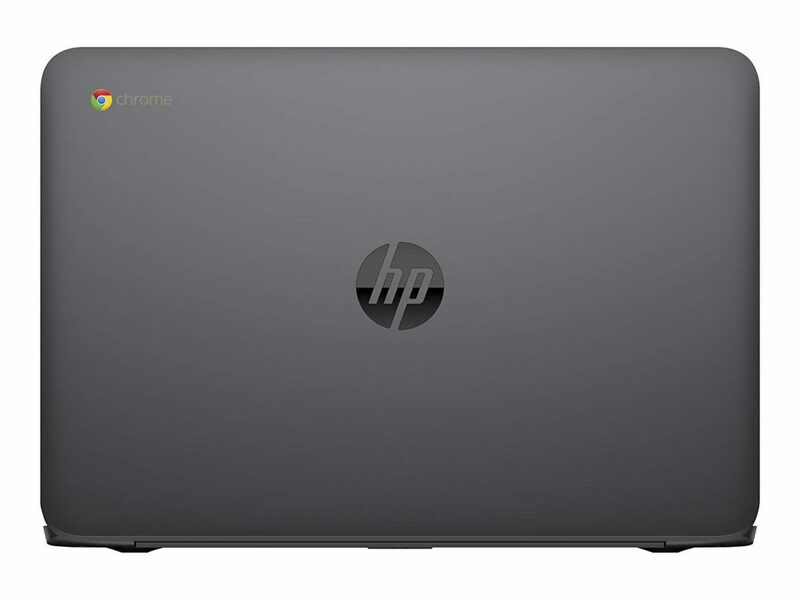 HP put a security lock slot, an HDMI port, a USB 3.0 port, a headphone jack and a microSD reader on the Chromebook 14’s left side, and a pair of USB 2.0 ports on its right side. The USB 2.0 comes in handy for connecting to USB devices such as a keyboard, mouse, external drive, printer, scanner or a USB hub. The power connector is on this side too. Notably, the left side carries the bulk of the port system. There’s a TrueVision HD webcam at the top center of the bezel. It takes decent pictures but images are splotchy. Still, while it’s not the best, it does get the work done. That means easy Skype calls and conferencing without those annoying drop-offs. Next to the webcam is the webcam light and internal microphone (records sound while on calls). There is no DVD player as is common with Chromebooks. The HP Chromebook 14 is no different and it plays by the same rules. Most Chromebooks have okay sound with few actually having great built-in stereo speakers. The HP Chromebook 14 speakers fall in this category, with hollow-sounding down firing speakers. The speakers are loud and clear enough to play a movie for a small gathered crowd. Still, if you’re an audiophile, you’ll want a good pair of headphones instead. What’s the catch with this Chromebook, you may ask. Well, for starters the 2.16 GHz Intel Celeron N2840 processor gives this HP Chromebook 14 decent performance. The processor is ideally meant to be a power efficient entry-level processor for notebooks. It works best for internet or Office tasks and not complex software or modern games. Generally, it is an economy CPU with speeds of 2.86 GHz at Turbo. As a result, the CPU occasionally chocks under load. The processor works in Sync with the 4GB DDR3 SDRAM memory and modest 16GB solid state drive storage. The processor works in Sync with the 4GB DDR3 SDRAM memory and modest 16GB solid state drive storage. The SSD makes for awesome speeds. First of all, it takes 3 to 4 seconds to boot up and installed apps load up pretty fast well. As for storage, for this Chromebook and others, you will have to make a decision between installing new apps and saving data. Alternatively, you can opt for more storage via the microSD card and 1TB cloud storage available for Chromebooks. Note: Chromebooks don’t come with MS Office because those are Windows products but the HP Chromebook works well with spreadsheets. Essays, research papers, homework, and chatrooms might take up a chunk of your time. So you need a laptop with a comfortable and dependable keyboard. While Chromebooks aren’t specifically built with luxury or mechanical keyboards, the HP Chromebook T4M32UT#ABA 14-Inch Laptop offers the next great thing; a full sized keyboard. The keys have reasonable travel and you need average (63 grams) actuation force to type. The deck also comes with ample space for your palms to rest, making working for long hours a cinch. The touchpad occupies an extensive section of the lower deck. We had no qualms working with it being that is sizeable and responsive to touch and gestures. The buttonless touchpad offers just the right amount of sensitivity for both two-finger scrolling and three-finger swiping. A sizeable battery can be your biggest ally in a day filled with classwork or hours of idle time on a flight. The HP Chromebook T4M32UT#ABA 14-Inch Laptop battery lasts 6 hours on battery tests which in the grand scheme of things is average. In comparison, the Dell Chromebook 3189 leads the pack with 9 hours 5 minutes. Meanwhile, the favorite Acer Chromebook 14 follows suit with an extended battery life of 8 hours. Most laptops we know of have a warranty covering them, be it accidental cover as a result of spills and drops or extended warranties. The HP Chromebook T4M32UT#ABA 14-Inch Laptop also has a one year warranty to its name. But you can opt for an extended warranty just to be safe for the long haul. 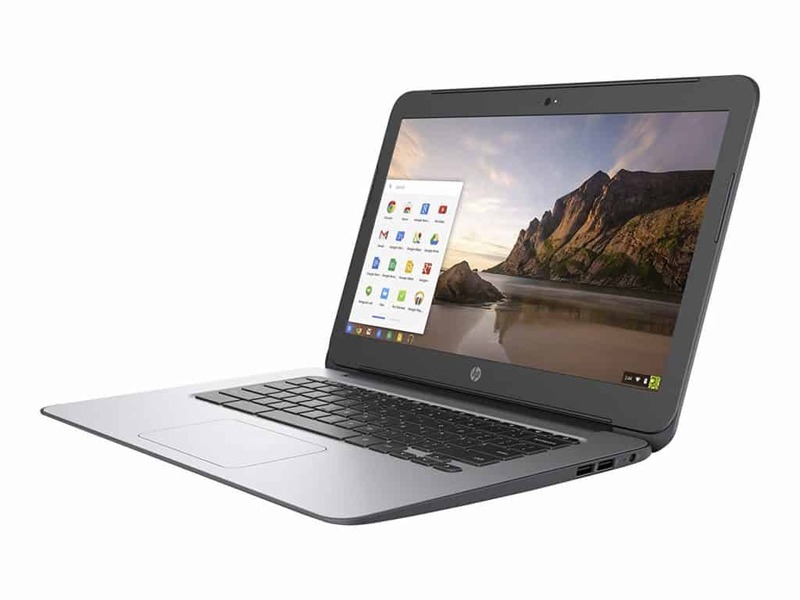 Compared to other Chromebooks, the HP Chromebook 14 strikes a good balance between ample screen space and portability. A comfortable keyboard and trackpad coupled with standard screen make it a joy to work with, especially when browsing the web. Our biggest gripe with it is the average battery life which means making buddies with your laptop charger. Also, it admittedly shows some sluggishness every once in a while, most especially when under load. That definitely ruins an otherwise awesome experience. 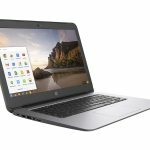 Other than that, for slightly above $200, the HP Chromebook 14 is a great value machine that’s more affordable than a bunch of other Chromebooks in the market (Toshiba Chromebook 2). Ultimately, the Acer Chromebook 14 remains as our Editor’s Choice for better performance and battery life. But the HP Chromebook 14, despite its shortcomings, shows some promise and is a reasonably modest investment worth considering.